Scheduled maintenances are the best way to inform users of upcoming maintenance activity. All upcoming scheduled maintenances are displayed on the status page and in iCalendar subscriptions. Click the Start button when you’re ready to begin the maintenance. Once a maintenance has begun, it will be displayed on the main status page and the status bar will change to show that a maintenance is actively in progress. The status will be toggled for each component and container to indicate they are undergoing maintenance. Updates can be posted throughout the maintenance activity. Notifications are on a per-update basis — Choose to broadcast each update or only post the updates on the status page. Click the Finish button when the maintenance has been completed. Completed maintenances are moved to the history page. Automated maintenances will start and end without any intervention. 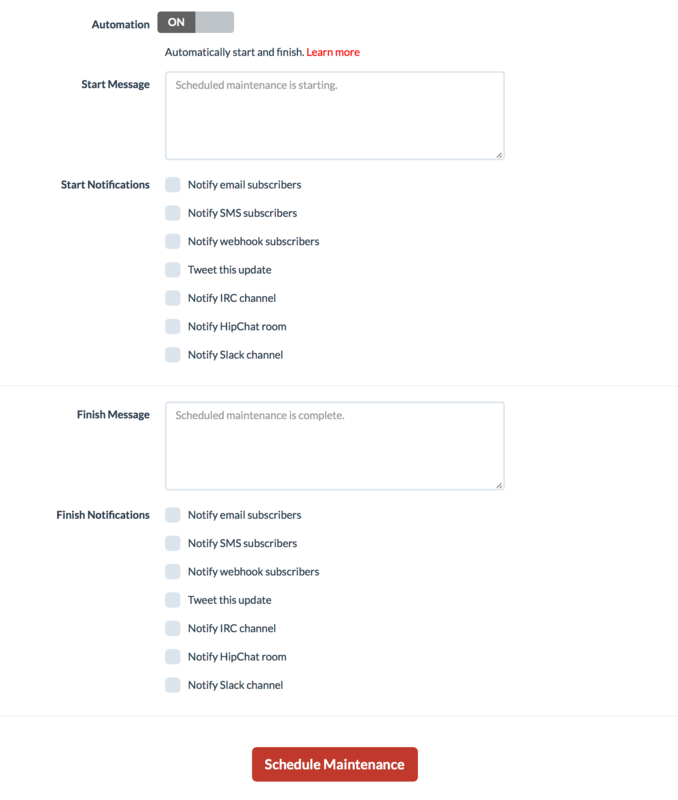 Toggle the automation setting when scheduling a new maintenance. Select notification types and specify the desired start/finish message content.